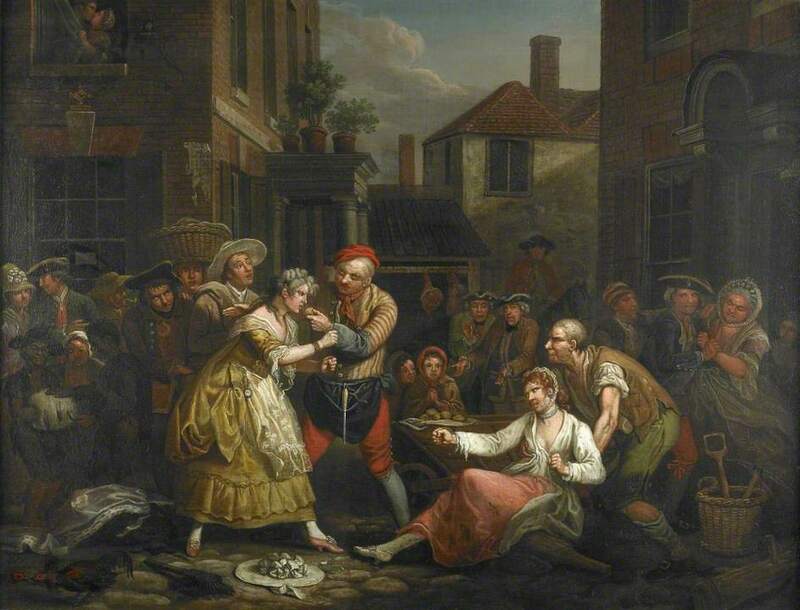 The Female Bruisers, John Collet, 1768, Museum of London. 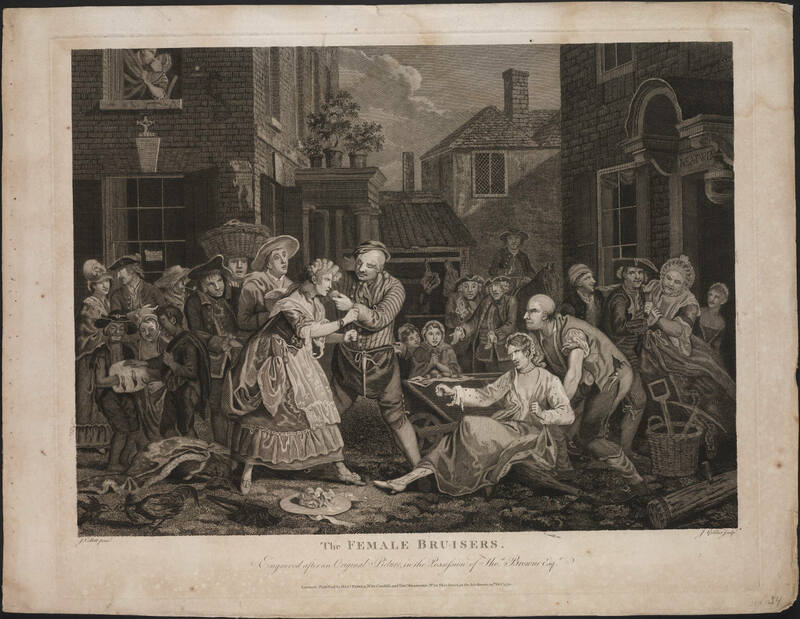 The Female Bruisers, engraved by J. Goldar after John Collet, 1770, Yale University Lewis Walpole Library. Once again I am indebted to Adam Hodges-LeClaire for pointing me to this piece. John Collet pops up here and there on this website. His A Rescue, or the Tars Triumphant is one of my absolute favorite pieces. I had glanced at this piece in the past, but didn't put much thought into it, as it did not have an apparent maritime connection. That is, until Adam pointed me to the right of the frame. 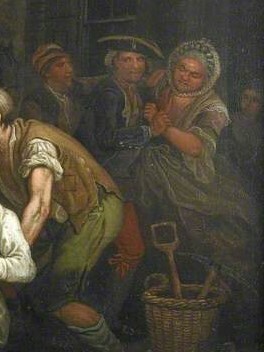 Two sailors, happy to take in the free entertainment of a pair of 'Female Bruisers,' restrain a madam from interfering. These mariners are the opposite for the righteous defenders of prostitutes Collet extolled in The Tars Triumphant. The Museum of London Version is the original, but is also low resolution, so I'm pairing it with a high resolution print from the Yale University Lewis Walpole Library to tease out the details. 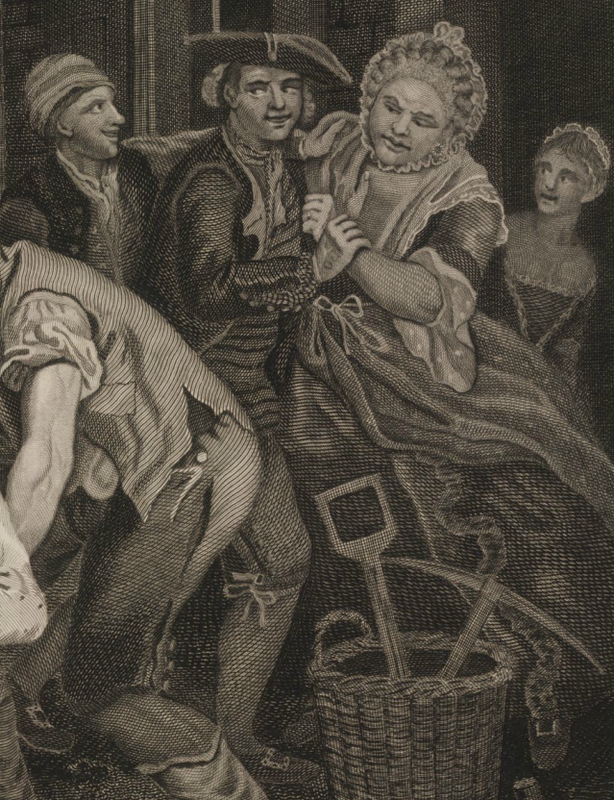 The sailor in the foreground wears a cocked hat bound in gold or white tape over a loose white bob wig. His blue jacket with white metal buttons is double breasted, and the mariners' cuffs are open. A closely knotted handkerchief of indeterminate pattern hangs from his neck. It rests over a single breasted waistcoat with narrow horizontal stripes. His check shirt is peeking out from under the jacket. Red breeches are tied at the knee. His shoes bear rectangular buckles. His mate wears a single breasted jacket over a plain single breasted waistcoat. Our mariner's shirt is open, and he is notably without a handkerchief.